We can take your mailing list and process it through our postal software. This will format it correctly for the USPS. We then address your mail including the USPS Intelligent Mail Barcode, which contains additional information for the post office. Afterward, we tray or sack your mail and present it to the post office with the proper mailing paperwork. By inkjetting the barcode and sorting the mail into trays and sacks, we do some of the work for the post office. This allows you to benefit from reduced postage costs! Generally, you have two options on how fast your mail will travel in the postal system. 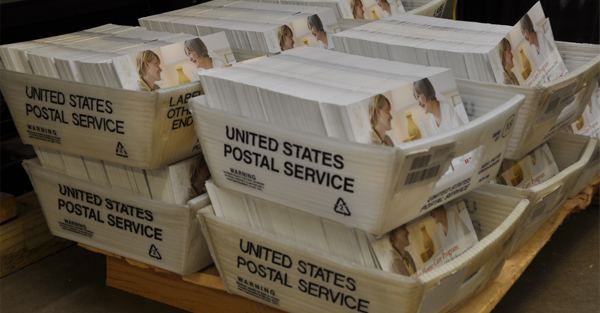 First Class mail is processed by the USPS on a priority basis – it goes to the front of the USPS line. Locally, first class will typically be delivered in 1-2 days and nationally; all of it should be delivered by about 4 days. Your mail will be forwarded at no charge for a period of 1 year. If it’s undeliverable, it will be returned to you at no charge with the reason for non-delivery. Standard Mail is processed by the USPS on a “time available” basis. There is NO guaranteed delivery time. It’s the least expensive postage, a bit more than half the price of 1st class, which enables you to mail lots more for less. Standard mail is not forwarded and not returned if undeliverable. It merely goes in to the USPS recycling bin. Presorted mail pricing is based on the breakdown into trays. The price varies on the concentration of the delivery addresses. Trays that contain mail for one zip code are less expensive than trays that contain mail for multiple states. The levels are: single zip code, local sorting facility (serving multiple zip codes), and regional sorting facility. The price for your mailing will be calculated after our postal software has processed your mailing list and determined the tray breakdown based on USPS tray minimums. For questions or more information on the mailing service we offer, please call our customer service department. We are ready to help you with your next mailing project! Don’t forget that we can provide package pricing for printing and mailing your next project.